This site hosts my writing and media appearances including news about the documentary movie, Accidental Anarchist. I am a former British diplomat who resigned over the Iraq war. I now run the world's first non-profit diplomatic advisory group, Independent Diplomat. He could never be a diplomat: Carne Ross remembers his father telling him that from an early age, at home in South London. To be a diplomat, his father explained to his twelve year old son, you had to be very smart. And he made it clear that he didn’t think his son was the smartest in the family. For her sixteenth birthday, he gave his daughter the complete works of Shakespeare. Carne and his twin brother got guns. 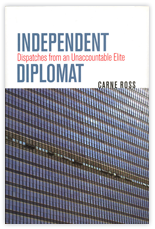 Very few diplomats talk about their humiliations as much as Carne Ross. But not many have transformed them into this much drive. At 22, Ross was accepted into the British diplomatic service. From London he went to Bonn, and later to United Nations headquarters in New York. He moved into a swanky Manhattan apartment and would soon have become ambassador. And then, after 15 years, he gave it all up. The lies had become too much. That’s eleven years ago now. Ross was 38 years old, and he had observed the diplomatic world from above his whole life. Now he wanted to try another point of view. 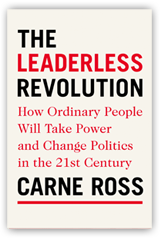 Ross began to advise those who had no voice in the world’s conflicts. Working with 30 young colleagues from a sunny office loft in Manhattan, he now negotiates for the Tamils in Sri Lanka, the government of Somaliland, Western Sahara, the Marshall Islands, and Syrian opposition groups. The only thing left from Ross’s former life seems to be his neat three-piece suit. The first time I met Carne Ross, it was in a cold shared taxi in Utah. He was going to give a lecture at the Sundance Film Festival, and we began talking. It was dark and rather late in the evening, and his story—which he told me for the first time in his Oxford English, wrapped in a warm parka, during this long taxi ride—seemed all the more eerie. He had once firmly believed that governments existed to prevent chaos. But in 15 years of diplomatic service, he had become convinced that governments were the reason for much of the instability in the world. In his job with the British Foreign Office, he had first lied for his government out of conviction, then with misgivings; by the end, more and more often he had felt a nagging guilt. The story Ross told that evening began in the late 1990s. He had just begun working at the United Nations, and the most powerful countries in the world were using economic sanctions to force Iraqi dictator Saddam Hussein, following his attack on Kuwait, to provide proof that he had no more weapons of mass destruction. Ross was to negotiate the sanctions for Great Britain. “Even though my government believed that Saddam Hussein’s weapons were no longer a threat,” says Ross. He simply accepted this at the time. Years later, when he realized he couldn’t stand his job anymore, he testified to this before a fact-finding commission on the Iraq war. The sanctions, he said, were only intended to prevent Saddam from rebuilding his army with oil revenues. A complete trade and financial embargo was imposed on Iraq, and its entire economy collapsed. Reports on the humanitarian situation in Iraq were devastating, says Ross. Experts estimated that 500,000 children under five years of age had died as a result of the sanctions; there was barely any clean water, because chlorine could no longer be imported, and medical care was a disaster. In 2002, Ross took a one-year leave in order to reflect. Until then, he had believed that democracy was best served by a well-informed decision-making elite. He thought you could see more from above than from below. But in his view, this went completely wrong in Iraq. A large amount of information was simply ignored. Many voices were not heard at all, while others were listened to all the more carefully. Thus instead of making an exception for chlorine in the embargo, one was made for Wrigley’s chewing gum. It was classed as humanitarian aid—and the company did not need to relinquish its millions in revenue from Iraq. Ross read Kant, Wittgenstein and Karl Popper and attempted to find an answer to the question of how global elites could make better decisions. Countries disintegrate into fragments, fewer conflicts are fought between states and more within states, and he decided that the world and its political methods were not at all prepared for this. In his deliberations, Ross returned again and again to one thought: The problem of global elites is that they are not held accountable for the consequences of their decisions. New York and Bagdad are ten thousand kilometers apart. Those deciding the fates of other countries need fear neither elections nor demonstrations. But what could he do to change this? After his leave of absence, Ross first went to Kosovo as UN Coordinator, but there, too, he kept asking himself whether his work was making the region more or less stable. Along with the most powerful countries in the world, he negotiated the fate of the Kosovars without including them in the process in any way. But how could they be expected to back any decision if they were not involved in it? The Kosovars needed a diplomat to advocate for their interests, he thought; one who could get them a meeting with the UN in New York. Someone like Carne Ross. His bosses in London didn’t really make his decision difficult. In Great Britain, his colleague David Kelly, an internationally-respected UN weapons inspector for Iraq, had just committed suicide. He had criticized a dossier that Prime Minister Tony Blair wanted to compile on the threat of Saddam’s weapons of mass destruction, calling it exaggerated. The weapons would later serve as the reason for the invasion of Iraq. The English government publicly pilloried Kelly; his reputation was called into question, his career destroyed. Soon after, Kelly was found dead in a forested area. “They destroyed him with their humiliations,” says Ross. Ross wanted never again to be dependent on this kind of politics. In 2004 he announced that Kosovo would be his first client as an independent diplomat. For the past ten years, he has been working to implement his ideas of better diplomacy from a sunny office loft in Manhattan. The office door says ID, Independent Diplomat. On the wall hangs a large map of the world. He is now helping countries, says Ross, whose fates he once decided from afar. Right now he spends a great deal of time advising the Syrian National Coalition. Ross fought for a long time for them to be included in negotiations about their future. The rebels have just agreed to begin peace talks with Assad in January. Ross is now preparing the Coalition for this. Ross helped Kosovo on its path to independence. It was celebrated Kosovar style, in a white stretch limousine on the streets of Manhattan, with plenty of music and songs of liberation. The Syrians, said Ross, want first of all for someone to listen to them. He recently went to Syria to observe an experiment that no one would have expected in this war-torn country. Assad’s power structures disintegrated during the war, and the Kurds began to replace the state with a network of citizens’ assemblies and community councils. What emerged was not chaos, but a functioning self-government. The former elite diplomat stood watching all this in Syria. He said nothing. He asked questions. He didn’t lecture, he learned. He simply listened for a change. This entry was posted in Uncategorized by carne. Bookmark the permalink. So bold, so full of incontestable truths and overwhelming convictions, that it should be read by every diplomat, politician and thinking citizen with the courage to pick it up. Copyright © 2019 Carne Ross. All Rights Reserved.